Even by Washington's standards, Leon Panetta's resume portrays the ultimate insider - a smooth navigator of Congress, the federal budget, the White House and the CIA. He's worked for both Republican and Democratic presidents. And the CIA's role in last month's successful Osama bin Laden raid and the killing of America's Number One enemy, gave his solid gold credentials new lustre. And now, after four decades of public service - and years after most people are long retired - the 72-year-old Panetta is taking on his most challenging job ever: Secretary of Defense, as the nation fights a grueling war in Afghanistan, extricates itself from Iraq, and the Arab world is imploding. Panetta slides somewhat reluctantly into the witness chair on Thursday for what is expected to be a quick endorsement by the Senate Armed Services Committee. Friends say Panetta could never have refused the President, considering his rock-solid commitment to public service. But he didn't say yes right away, no doubt thinking about returning to Carmel Valley and the the Leon & Sylvia Panetta Institute for Public Policy, based at California State University, Monterey Bay that he and his wife founded. "Leon, I know that you've been looking forward to returning now to Sylvia and your beautiful Monterey, so I thank you for taking on yet another assignment for our country," Mr. Obama said when he formally announced Panetta's nomination in April. "The patriotism and extraordinary management skills that have defined Leon's four decades of service is exactly what we need in our next Secretary of Defense," President Obama added. And he understands how and where the money flows. As a Congressman he served as Chairman of the Budget Committee. He was director of the President Clinton's Office of Management and Budget and served as his Chief of Staff. Maybe most important of all, he's someone President Obama trusts. Jennifer Palmieri worked for Panetta on Capitol Hill and at the White House. She was an intern when she first signed on. "I thought everyone in Congress was like him. I was too young to realize everyone wasn't as talented and as energetic as he was." She says the son of Italian immigrants has always held public service in the highest regard. Gates and Mr. Obama were able to tap into that. "Ultimately he's not going to say no," Palmieri said from her office at the Center for American Progress in Washington where she is Senior Vice President of Communications. Panetta's strongest asset in wrestling the gigantic Pentagon bureaucracy, and the vast defense industry as well, is his willingness to work through the big problems, Palmieri suggests, pointing to big budget battles in his past. "His mantra has always been -let everyone have his say," according to Palmieri. That means getting everyone together, and allowing everyone to make their points, even if critical of Panetta himself. "I think he would always say, you can't slam dunk anyone in the town." "There's really not a very big ego there," Palmieri said. "He can have his moments but it more that he is so warm and engaging." When tapping Panetta for the job, Mr. Obama praised him for standing up for his CIA employees. He is "utterly committed to straight talk with both his staff and the administration," said one intelligence insider, who requested anonymity. "(Panetta's) style connects with people in the building. He is people oriented and mission focused." The intelligence source points out that Panetta's worked very closely with the Defense Department while he was at the CIA, and not just on the mission that brought down Osama bin Laden. Other top Al Qaeda leaders have been eliminated, including al Qaeda's former number three leader, Sheikh Said al-Masri. The CIA also uncovered the covert nuclear facility on Qom, Iran in 2009 and with the help of Saudi Arabia stopped the cargo bomb plot. Of course there were setbacks too, including the double-agent suicide attack in Khost, Afghanistan that killed seven CIA employees. Former Deputy CIA Director John McLaughlin said Panetta's tenure at CIA headquarters, where there are never any easy answers, will be valuable as he moves to the next post. "That's pretty good schooling for the kinds of decisions he is going to have to make at the Pentagon where budget cuts are obviously going to be necessary and difficult choices are going to be necessary," McLaughlin told CNN in April. And Panetta brings special knowledge of working with the U.S. military on Afghanistan and Pakistan. "We've just come off of ten years where the CIA has been closer and more intimately connected to the military than anytime in its history," McLaughlin said. "There's a kind of intimacy between the military and the intelligence cultures that probably didn't exist 10-15 years ago." His former Clinton White House colleague and Democratic strategist Paul Begala is also full of praise for Panetta. He says Panetta has definite advantages moving to the Pentagon. "He has substantial expertise. He has the ethical standards. And he has the relationship with the President," Begala said. "He has come through tough days and always came out clean." And he has a knack for winning over enemies. Fran Townsend, who was counterterrorism advisor to President George W. Bush, tells how she had publicly opposed his nomination to lead the CIA. Later, when they were sitting next to each other at a formal dinner, she told him she had been wrong. Panetta surprised her by immediately asking her to serve on the President's Intelligence Advisory Board. "I'll speak my mind," Townsend warned Panetta. "That's exactly what I need," Panetta replied. Townsend says she was stunned. "He's made a fan out of a critic; not an easy job in Washington," Townsend said. And she praised the budget expertise he will bring to the Pentagon table. "He's the right resume that the country and the President need, at the right moment," she says. Some will say the Pentagon post with two wars, unexpected crises, and world travel demands a younger person in the top job. "Anybody who's been in his company would guess 63 rather than 73," Townsend said. Panetta was born June 23 1938. And he often talks about the importance of family. 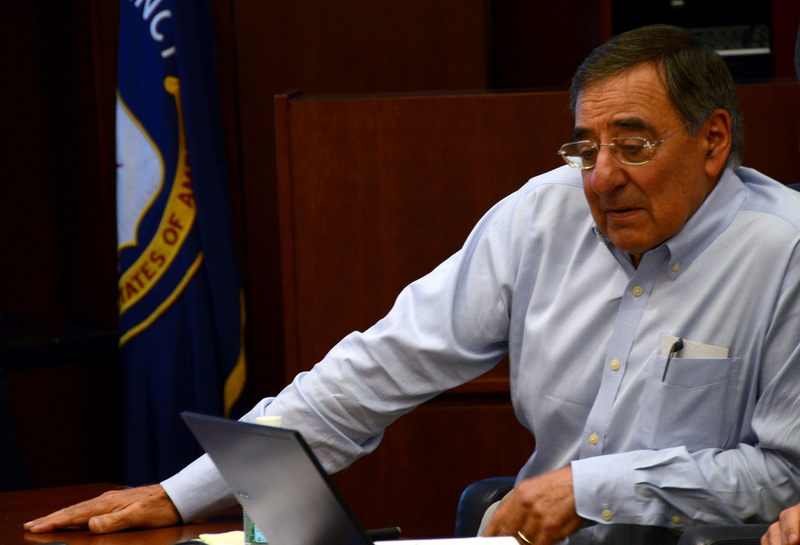 "If confirmed, I will be relying heavily, as I always do, on the support of my wonderful family – my wife, Sylvia; my three sons, Chris, Carmelo, and Jim; their wives; and our six grandchildren," Panetta said at the White House in April. "In my 40 years of public life, they have been tolerant beyond measure, and very loving, and because of that I love them all very much." With his reputation as a Washington consensus-builder, there are inevitable questions about whether Panetta is tough enough to stand up to the Pentagon brass. Michael Cohen, senior fellow at the American Security Project points to a quote in the book, "Obama's Wars" by the Washington Post's Bob Woodward about how Panetta warned of the political costs of a Democratic Administration going against military advice. "No Democratic president can go against military advice, especially if he asked for it," Woodward quoted Panetta as saying during deliberations over moving more U.S. troops to Afghanistan. "That particular viewpoint is that Democrats are weak on national security issues and can't stand up to the military," Cohen said. "It suggests he misunderstands civilian-military relationship in this country and ..."I think that would be a good question to ask him (Panetta)," Cohen said. Panetta boasts of his own military background. "I spent 40 years in public service, and it began when I served in the Army as an intelligence officer in the 1960s," Panetta said. "I was proud to wear the uniform of our country, and my respect and admiration for our nation's armed forces has only grown in the decades since." As Secretary Gates finishes up his work at the Pentagon he praises Panetta as the best person to succeed him. And Panetta picks up the unfinished business of the Gates era of keeping the strongest military in the world. "Yet this is also a time for hard choices. It's about ensuring that we are able to prevail in the conflicts in which we are now engaged," Panetta said at the White House. "But it's also about being able to be strong and disciplined in applying our nation's limited resources to defending America. None of this will be easy, but I am confident, Mr. President, that you can be assured that I will give you, the nation's Commander-in-Chief, my best and most candid advice about these issues, and that I will be a faithful advocate for the brave men and women at the Department of Defense who put their lives on the line every day to ensure that we achieve that great American dream of giving our children a better life and a more secure America," Panetta said. And his beloved California and his institute await his eventual return from Washington. Dianne Harrison, President of California State University Monterey Bay, describes the benefits of having the Panetta Institute there, offering degrees in Public Policy, attracting prominent politicians and other VIP's for lectures and launching interns to Washington. She talks about the impact the Panettas have had on the campus and students. "He is a person of unrelenting energy and optimism," Harrison says about Panetta. And with all his accomplishments listed in his Washington resume, he is always ready to provide some individual inspiration to students. "He has a natural touch," Harrison said. "He is very approachable." And long-time friends like Palmieri predict that same trait will come in handy at the Pentagon, ready to talk to four-stars and privates as well. But when the door shuts, Panetta will be alone with his yellow legal pad, that she recalls from his previous posts, with the latest 'to do' list. Every night he runs down the list, revises it and set the priorities for the coming day. "He really, really does his homework," Palmieri says.